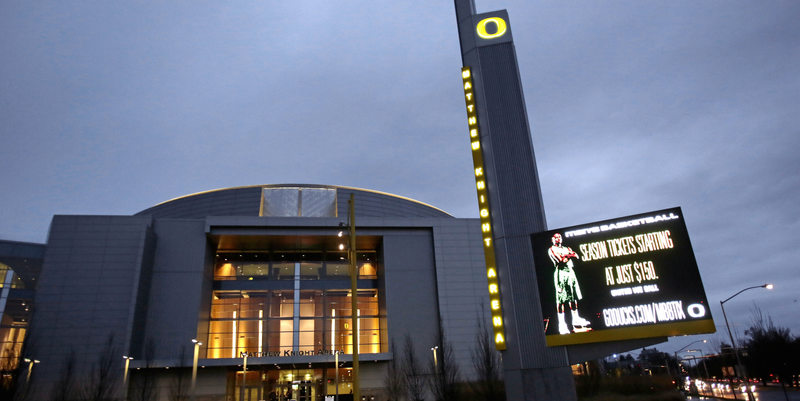 A woman who spoke out against the University of Oregon after it accessed the counseling records of a student who said she was raped by several basketball players has been let go, according to an email she sent to colleagues today. In the email, which was first obtained by the Register-Guard, Karen Stokes said her position had been terminated but what happened "will not make this issue go away." The student said she was raped by three basketball players last year and in January she sued the university, saying the school tailored and delayed their discipline so the men could play in the NCAA tournament. (Last summer, the school found the players responsible for the student's sexual assault.) But before filing the suit, the student learned that Oregon already had taken her campus counseling records from when she sought help and given them to the university's lawyers to prepare for litigation. In court filings, Oregon argued the seizing of the records was legal. Stokes was executive assistant to the director of the counseling center; she worked there with Jenny Morlok, a senior staff therapist. They both signed a letter of concern in February outlining what troubled them about Oregon's conduct. Morlok said she was told to provide "non-standard care" to the student that "went against my ethical and professional standards." The letter also mentioned the records being accessed by Oregon's legal counsel without the student's permission or any "proper authorization." In her email sent today, Stokes wrote that she and Morlock had hoped their going public would "promote positive changes." Instead of taking our concerns to heart and recognizing the courage it took to come forward with such concerns, the UO appears to be more concerned about defending itself and attacking those who brought the ethical and legal concerns to light. We had hoped for, and requested, an unbiased, independent investigation. Instead, the UO hired a labor defense attorney with tax-payer dollars who seemed more concerned about challenging Jenny and me and accusing us of wrong-doing than about recognizing the legitimacy of our concerns and working to find appropriate solutions to these concerns. Stokes goes on to say they are troubled by the different reasons they've been given by the counseling center to justify what happened, but she hopes her colleagues continue pushing to promote "a higher level of ethics and professionalism regarding how the UO responds to records inquiries and other problems noted in our letter of concern"
We all have the responsibility to protect privacy and not be complacent about the violations that we see. If others are silenced because of what happened to me, it will have dire consequence to the students we serve and the confidentiality and privacy of medical records in general. Even though I may not be here beyond this week, I urge anyone who has concerns such as our at any point in time to speak up so that the proper changes can be made to protect against violations of the law and inappropriate disclosure of medical records or other legal or ethical violations that may be occurring at the Counseling Center and the UO. Do not allow leadership to intimidate or silence you with threats, attacks or even the potential loss of your job. Do not lose sight of the importance of standing up for what is right. As for the student's counseling records, the Register-Guard reported that the university has returned them to the counseling center. The full email from Stokes is below. Update: An Oregon spokesman told the Register-Guard that Stokes is still employed by the university. He added: "At her request, there is a transition in employment under way. This is the result of an employment process that began long before Ms. Stokes raised any concerns about the university actions."